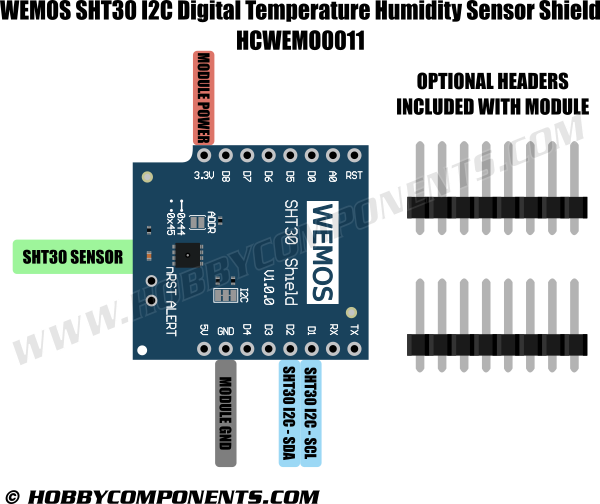 The WeMos SHT30 shield is a digital temperature and humidity sensor based upon the Sensirion SHT30 Sensor IC. This shield adds the ability to sense temperature to an accuracy of +/- 0.3oC and relative humidity to +/-3%. It is compatible with the WeMos mini, mini Pro (see item HWEMO0002), and mini lite (see item HCWEMO012) ESP8266/8285 based development boards. Although it is intended to be used with these WeMos boards is can also be used as a standalone module for other development boards. To make programming this shield from your D1 mini / Arduino board as easy as possible we have created our own HCSHT3x Arduino compatible library. See below for where to download this library. WeMos SHT30 I2C Digital Temperature Humidity Sensor Shield (HCWEMO0011). #include <HCSHT3x.h>      //Include the HCSHT3x library. #define I2CADD 0x45       //I2C address of the SHT3x (0x44 or 0x45). HCSHT3x HCSHT3x(I2CADD);  //Create an instance of the library. Serial.begin(9600);     //Initiliase the Arduino serial library. //Trigger a temperature & humidity measurement and read back the results. //If there are no errors out put the results to the serial UART. //Wait a second before taking another measurement. Could you please show me how the code would be like if there were two SHT30 wired together? HCSHT3x HCSHT3x1(I2CADD1); //Create an instance of the library called HCSHT3x1..
HCSHT3x HCSHT3x2(I2CADD2); //Create another instance of the library called HCSHT3x2. Serial.begin(9600); //Initiliase the Arduino serial library. HCSHT3x1.init(); //Initiliase the first instance of the library. HCSHT3x2.init(); //Initiliase the second instance of the library. //Trigger a temperature & humidity measurement for instance 1 and read back the results. //Trigger a temperature & humidity measurement for instance 2 and read back the results.